What does Solar Choice do? 10kW solar systems are a great investment for Australian homes with high levels of electricity consumption or businesses with relatively small electricity needs. This article takes a look at 10kW solar system pricing, energy production and returns in Australia. How many panels & how much roof space for a 10kW solar system? A modern-day 10kW solar system will be comprised of between about 30-40 panels and will require about 50-68 m2 of roof space, depending on the wattage of the panels. You can explore your own roof’s solar potential here. Australia is home to some of the lowest solar installation prices in the world, and 10kW solar systems – because of their size – frequently offer some of the best value of any solar PV system size. 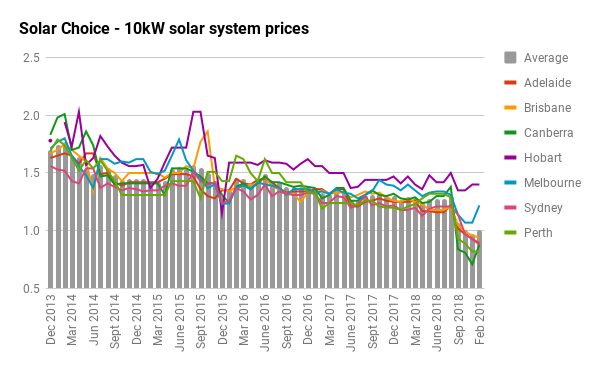 According to Solar Choice’s own data, as of February 2019 the average price of a fully installed 10kW solar system in Australia is around $1.00 per watt – or about $10,000 for the whole system. You can view current indicative solar system prices here. For anyone looking to install a 10kW solar system, this price point can act as a reference point – some installers will offer a lower price, while others will offer a higher price. The thing to look for is the comparative value of the system – a balance between quality products and price. The chart below shows how 10kW solar system prices have changed since Solar Choice first started keeping track in 2012. Is a 10kW solar system right for you? The table below should give you some idea about whether or not a 10kW system may be well-suited to your needs – or if a better system size might be a better match. We recommend that you self-consume at least 30% of the the solar energy that your system produces. Remember: The table above is a highly generalised, indicative guide; it does not take into account your location or the tilt & orientation of your roof – not to consider system prices or financial details like payback period. If you’d like to take a more detailed look, use our Solar PV System Payback Estimator or our Simple Solar System Sizing Estimator. Also keep in mind that your network company may have a default limit on solar system size – they may not allow you to connect a system larger than 5kW to the grid without extra paperwork and inspections. Check with your solar installer or local network company for more details. These days solar feed-in tariff credits are a secondary benefit from having a solar system installed. Instead, you’ll derive the most value out of your self-generated solar energy by ‘self-consuming‘ it – using as much energy as possible directly. Because solar feed-in tariff rates are generally lower than what you’ll pay for energy from the grid, the more solar energy you use yourself, the more you’ll save; meanwhile, the excess solar will flow into the grid and earn you credits which help to reduce your overall bill. The table below gives a rough overview of the difference between retail electricity rates and solar feed-in rates by city, based on some of the most competitive offers available. The table below takes a look at payback times and internal rate of return (IRR) for those who install a 10kW solar system in select cities at two rates of self-consumption – low (20%) and high (40%) for a household that uses 35kWh of electricity per day at the rates listed in the table above. If you manage to achieve even higher self-consumption rates, the returns will look more favourable. Ready to shop for solar? Compare solar & battery storage quotes from installers in your area. I want to have solar system on my rooftop to compensate the average energy 30kwh/ day. I have noticed that the three spinning meters are installed on the meter board,one of which is shown higher energy consumption in the electricity bill. I am planing to have 6 kW of power system with batteries to compensate the house requirement in peak hours. Where do I need to place the net meter to minimise the grid energy. Also I could use the battery power at night?How many 100 Amph batteries( lead acid) needs for this purpose please ? We wouldn’t be the best folks to ask about technical & design matters (get in touch with an installer instead), but yes you should be able to use battery power at night – that’s what it’s for! By the sound of it, a partial off-grid solar system might be best suited to your needs. Check out the article to see if you agree. We don’t deal much with enquiries form the US (we’re an Australian company), but you’re welcome to attempt to work the numbers out for yourself using one of our solar calculator tools (scroll down for solar + storage calculators). My feeling, however, is that it will be very difficult for you to justify going off-grid financially. 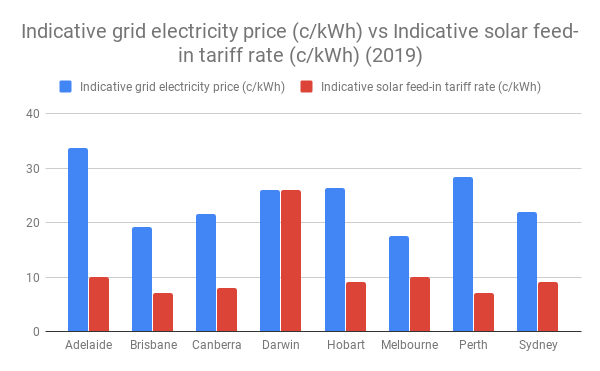 Solar installation prices in the states are still about 2x more than what they are in here, and your electricity rates are much lower (Australians pay about $0.20-25c/kWh for grid electricity). This is why Aus is one of the most promising markets for energy storage in the world! Best of luck with your system! You should probably remove old stats & articles like this.. Agreed, Steven – will be updating the article in the near future – system prices are down significantly compared to what they were when we first published this article in 2012! A 10kW solar system plus enough battery storage to carry a home through 3 days of inclement weather (see our article: ‘Can you go off-grid with a 10kW solar system plus batteries?’) would cost between about $40,000 – $60,000, depending on the components used in the system and the price put forward by the installer. Since you’ve already got a grid connection, it’s doubtful that it will be worth your while to cut ties with the grid, however (although it might be worth your while if you had a new-build home where you would have to pay for a new grid connection – which can easily cost $20,000). You might be able to make it worth your while by reducing your daily energy consumption to about 5-7kWh/day. We recently published an article about the situations where battery storage is already starting to make sense – you might want to check it out. We also have an off-grid system sizing estimator tool and a solar PV & storage sizing & payback estimator tool that you can play around with (not to mention a bunch of other calculators). We can also introduce you to a range of installers who would be able to give you quotes on systems that would meet your needs. Simply fill out the Quote Comparison Request form to the right of this page. WHat is the minimum off the grid system size required for a home using 30kw/day? I get a sense from looking at the information out there that is not as simple as estimating usage and then doing the math. Assuming that 30kW/day is your total daily electricity use, and that you use 60% of your electricity during the day, you’re looking at a sunshine-hours electricity load of (30kWh x 60% =) 18kWh/day. Depending on where you are located, a 3 or 4kW solar system should be big enough to meet your needs. We’ve written a bit about this topic previously: “How to get the most out of your solar system: Appropriate system sizing“. You’re right that it’s a bit more complicated than this, but this is the gist of it. We would be interested in hearing the other questions you have on the topic. Your excel webapp does not work on chrome. Internet explorer has less than 50% of the market. Why do you so constrain your marketing? The world is rapidly moving to open standards perhaps you should take this up with your web developers. Meanwhile I’m looking elsewhere. The calculator does work on Chrome, but you’ll need to navigate the different boxes with the keyboard arrows instead of clicking on the box that you’d like to edit. Sorry for this inconvenience–we are looking into updating and improving the calculator in the near future. This article mentions that a 10kWh solar panel would cost $21,000. Is that the U.S. Dollar or the Australian? And is that price the same if the panel is to be purchased by a buyer outside Australia? All prices are in Australian dollars and are only relevant to the Australian market. The price would be different in a different country and have nothing to do with importing or exporting–they reflect only the cost of a fully-installed solar PV system. They are not broken down into components and are unrelated to the wholesale cost of solar modules. Yes, solar panels can be and are used to run water pumps. The actual details (e.g. size of solar panel array and how to mount it) will depend on your circumstances. Click your state to learn about the benefits of going solar! What are the right solar PV cells for you? Impartial Tender Management of best value deals from commercial installers. Free business case analysis & quote comparison. Any special preferences for later discussion?